The Data Connect 2178WEE Wireless Ethernet Extender is an ideal and inexpensive way to extend Ethernet when no fiber or copper wiring is available. This means any computer or wireless—enable network device such as camera, security, and phone can connect to LAN without an additional cable via the DCE 2178WEE Wireless Ethernet Extender. In addition the DCE 2178WEE offers a four port switch physical LAN ports for any server, switches or network device. The DCE 2178WEE Wireless Ethernet Extender allows speed at up to 150Mbps by utilizing the new 802.11n wireless network capability. The radio coverage is doubled from the standard and high speed wireless connection twice as far as non- Ethernet Extender Wireless networks. The DCE 2178WEE can also communicate with the 802.11n, 802.11g, 802.11b standards. In addition, for maximum network security, the DCE 2178WEE Wireless Ethernet Extender supports the most up to date encryption including WEP, WPA-PSK AND WPA2-PSK. In order to simplify the security settings, the DCE 2178WEE also supports WPS configuration with PBC/PIN types for users to connect to secured wireless network easily. The Data Connect 2178WEE Wireless Ethernet Extender has user-friendly management interfaces so that it can be managed by workstations running standard web browsers. The DCE 2178WEE provides DHCP server, NAT, Virtual Server, DMZ, Access Control, IP Filter, PPTP/IPSEC pass-through, DDNS, and UPnP compatibility. 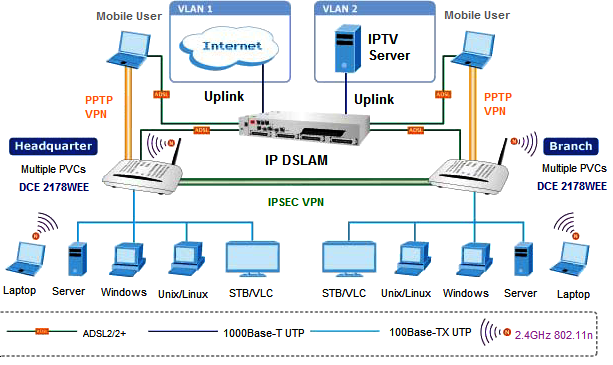 Furthermore for VPN tunnel, the DCE 2178WEE supports PPTP/IPSec tunneling. The Data Connect 2178WEE Wireless Ethernet Extender can also be configured to function as Wireless ADSL2/2+ Router compliant with 802.11 and features 1T!R MIMO antenna technology. 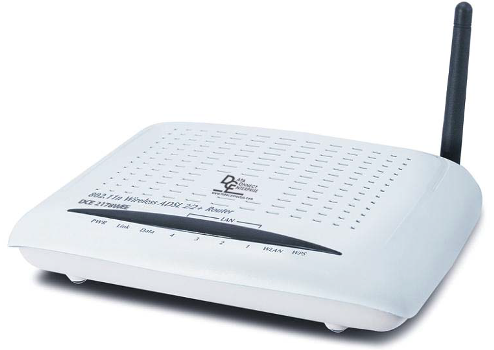 This allows your office to have both wireless Ethernet extension and high speed ADSL2/2+ broadband internet connection. The DCE 2178WEE supports PPPoA (RFC 2364 – PPP over ATM adaption layer 5), RFC2684 encapsulation over ATM (bridged or router), PPP over Ethernet (RFC 2156) and IPoA (FRC1483) to establish a connection with an ISP. The Data Connect 2178WEE Wireless Ethernet Extender provides the security of an internet firewall to protect the network from being accessed by authorized users. The DCE 2178WEE offers Network Address Translation (NAT). All the incoming and outgoing IPs can monitor and filtered and it can block internal users from accessing the internet, identified websites and content. This is wireless Ethernet extension – the way it is meant to be, fast, flexible and secure.